Diet in the zoo: They are fed two kinds of fish: silverside and lake smelt. They are also fed Bird of Prey diet. Location in the zoo: Coastal Aviary Exhibit in Texas Wild! Color black and white with some gray. Head, legs, feet, and wing tips are black. White neck, belly, tail, and underside of wings. 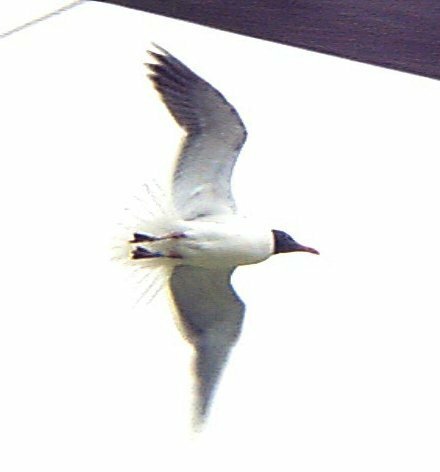 Head turns white and beak turns black during winter months. 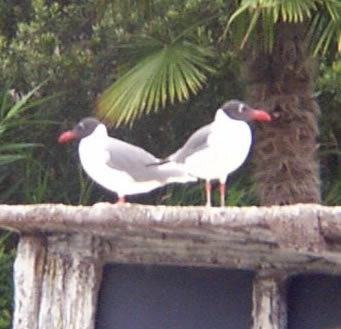 The Laughing Gull lives in colonies that can consist of thousands of nests. The female lays 2-4 eggs that are incubated by both the female and the male. They are known as scavengers that help keep the surrounding beaches clean of dead fish and garbage. They are also known to be thieves and will steal food directly out of the beaks of other birds. 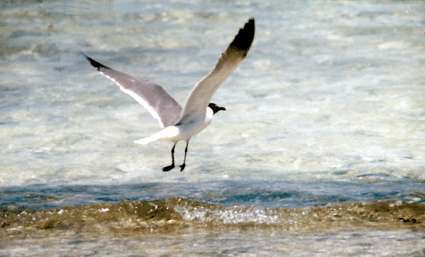 The Laughing Gull is named for its unique call, which is comparable to the human laugh. They compensate for their lack of fishing skills by scavenging and stealing from other birds. The females have developed the ability to replace eggs that don't survive by laying more eggs. They can do this up to four times. You can hear the gull call at this USGS link. There are currently 5 Laughing Gulls at the Fort Worth Zoo. According to the zoo keeper, the zoo feeds them very well, but they still scavenge and steal in captivity. 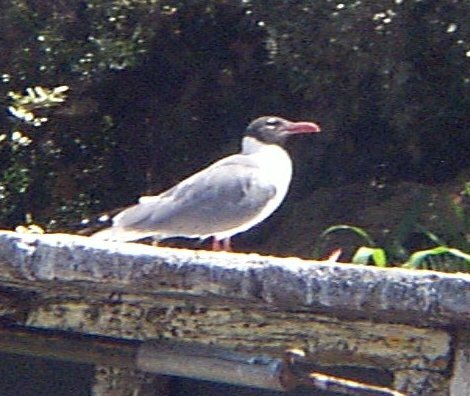 It took three visits to the zoo to find the Laughing Gull. I don't know where they might have been hiding during my first two visits; however, on the third visit I was able to observe their behavior. I counted only four gulls, but the zoo keeper claimed there were five. They did not fly very much. They seemed to spend most of their time swimming in the cool water or walking along the tin roof of the building. Unfurtunately, I never got to see them eat. It would have been fun to see them trying to steal from the other animals! McGraw-Hill Higher Education, 2000 .